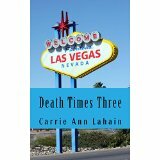 Death Times Three is made up of two short stories, Death of a Well-Loved Man and Dark Sekhmet, and one novella, A Killing in Corn Creek, all set in Las Vegas, Nevada. These are all murder mysteries with Elinor Gray, a librarian in charge of organising events at the local library, as the protagonist who finds herself at the centre of these crimes and can’t help but get involved in the investigations. Elinor is perfect as a sleuth, sharp, witty…and tough, and I took to her right away, this snippet tells you all about her. Elinor has obviously come through a bad time with a divorce behind her and in each of these stories she keeps coming across Detective Guillermo ‘Guy’ Villanueva, whose sister played a part in the break-up. I really enjoyed the interaction between Elinor and Guy, the dialogue was sharp and realistic and I have high hopes in that direction. I have long been an admirer of this author’s work and follow her thoughtful and thought provoking newsletter so I was delighted to eventually get to read some of her fiction. I was not surprised in the least to find it very well written with tight pacing and flowing storylines. One of my favourite authors is Sue Grafton who writes the alphabet series with Kinsey Millhone as the private investigator. I can easily see Lahain expanding this series of stories into longer length novels as Elinor Gray is a solid, likable and well thought out character with, hopefully, many adventures ahead of her.